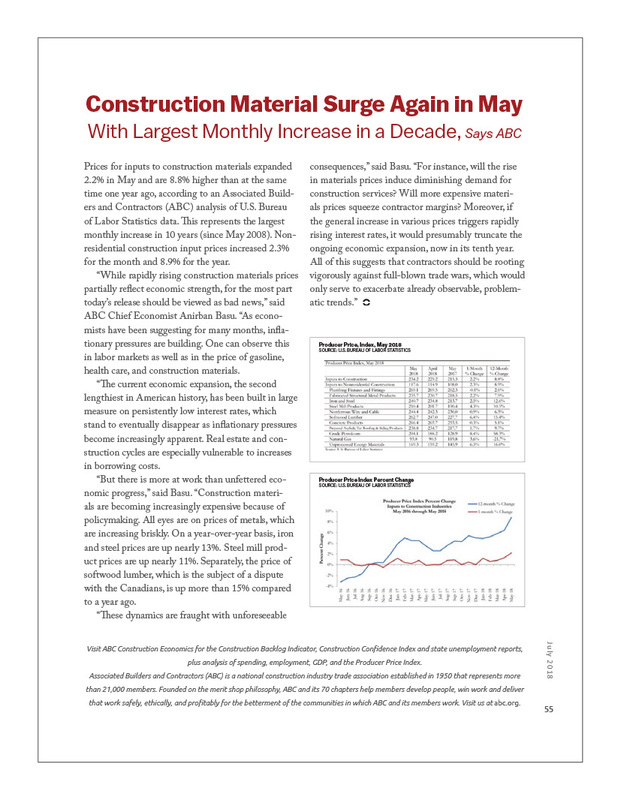 Prices for inputs to construction materials expanded 2.2% in May and are 8.8% higher than at the same time one year ago, according to an Associated Builders and Contractors (ABC) analysis of U.S. Bureau of Labor Statistics data. This represents the largest monthly increase in 10 years (since May 2008). Nonresidential construction input prices increased 2.3% for the month and 8.9% for the year. 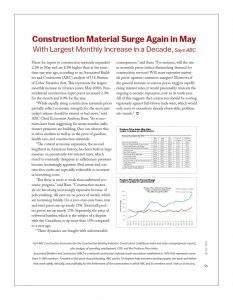 “While rapidly rising construction materials prices partially reflect economic strength, for the most part today’s release should be viewed as bad news,” said ABC Chief Economist Anirban Basu. “As economists have been suggesting for many months, inflationary pressures are building. One can observe this in labor markets as well as in the price of gasoline, health care, and construction materials. “But there is more at work than unfettered economic progress,” said Basu. “Construction materials are becoming increasingly expensive because of policymaking. All eyes are on prices of metals, which are increasing briskly. On a year-over-year basis, iron and steel prices are up nearly 13%. Steel mill product prices are up nearly 11%. Separately, the price of softwood lumber, which is the subject of a dispute with the Canadians, is up more than 15% compared to a year ago. 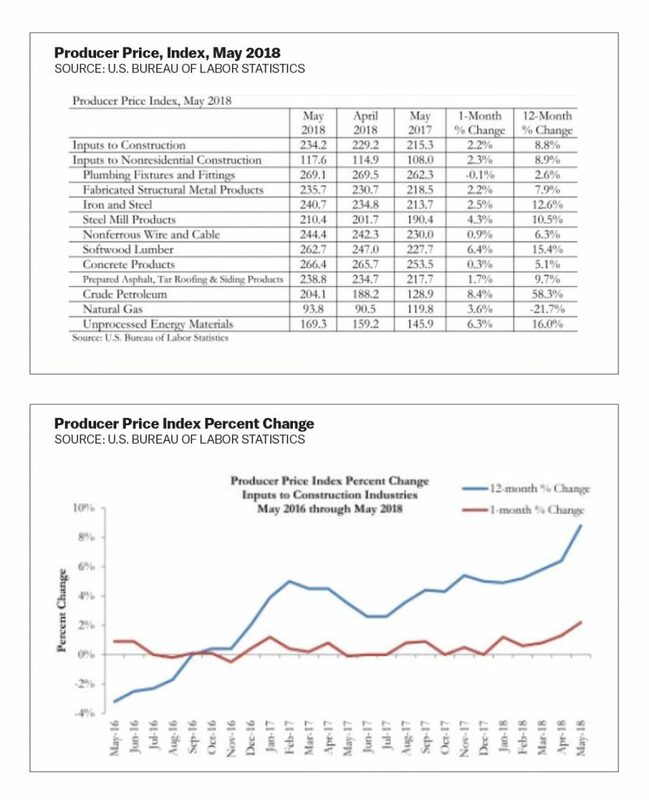 Visit ABC Construction Economics for the Construction Backlog Indicator, Construction Confidence Index and state unemployment reports, plus analysis of spending, employment, GDP, and the Producer Price Index. Associated Builders and Contractors (ABC) is a national construction industry trade association established in 1950 that represents more than 21,000 members. Founded on the merit shop philosophy, ABC and its 70 chapters help members develop people, win work and deliver that work safely, ethically, and profitably for the betterment of the communities in which ABC and its members work. Visit us at abc.org.